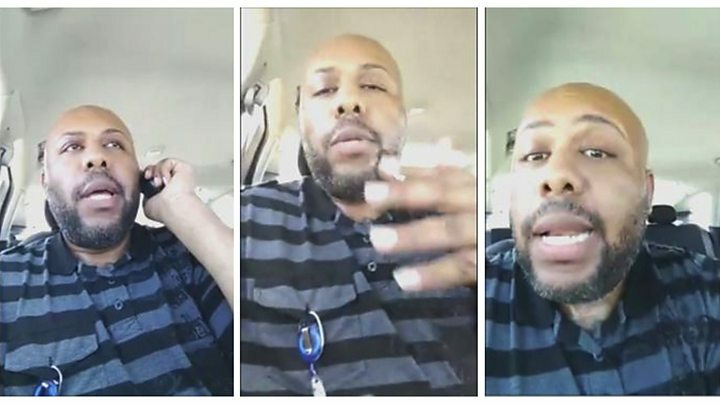 Media caption'Facebook killer' manhunt - what happened? A man suspected of randomly shooting a grandfather and posting video of it to Facebook has taken his own life. Police tracked down Steve Stephens after he was spotted by employees at a drive-thru McDonald's in Pennsylvania, who stalled his order and rang 911. State police gave chase and the suspect shot himself "as the vehicle was spinning out of control", police said. Stephens, 37, shot dead Robert Godwin, 74, as the victim walked home from Easter lunch on Sunday in Cleveland. The fugitive's mobile phone signal was last tracked on Sunday afternoon to Erie, 100 miles (160km) from where Mr Godwin was shot. Cleveland Mayor Frank Jackson told a news conference: "We have closure in regards to the search for Steve Stephens." Pennsylvania State Police said that they had received a tip-off from workers at the fast food chain shortly after 11:00 on Tuesday. The suspect's white Ford Fusion car had been spotted in the car park of the McDonald's in the city of Erie, near a local police headquarters. Stephens ordered a 20-piece McNuggets meal and a large order of fries, but employees held his fries while they alerted police. Henry Sayers, the restaurant's manager, told the New York Times: "He just took his nuggets and said: 'I have to go', and he drove off." State police pursued him for less than two miles before executing a tactic that involves ramming the rear of a vehicle to make it lose control. "As the vehicle was spinning out of control from the PIT manoeuvre, Stephens pulled a pistol and shot himself in the head," Pennsylvania state police said in a statement. During the encounter there were no injuries to members of the public or officers, and Stephens was pronounced dead at the scene, added Cleveland Police Chief Calvin Williams. Investigators said they were still baffled as to what motivated Stephens - who worked as a case manager for a children's mental health facility. Police said earlier on Tuesday that authorities had received more than 400 tips, including as far away as Texas. 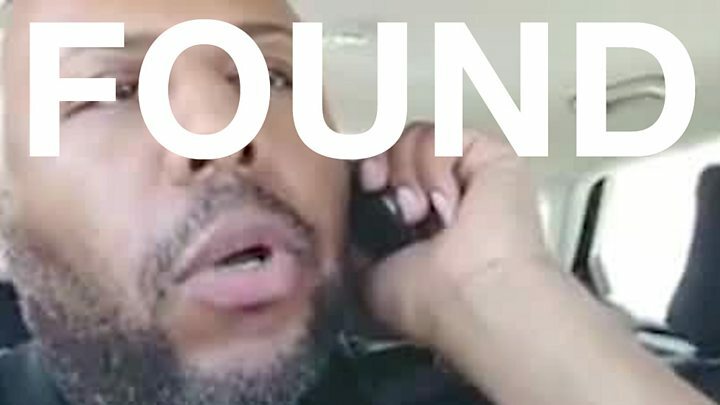 Image caption Pennsylvania State Police said that they had received a tip-off from an "alert citizen"
In other Facebook videos Stephens posted on the day of Mr Godwin's killing, the suspect said he had "just snapped", blaming gambling debts and a broken-down relationship among other things. The family of Mr Godwin - a father of 10 and grandfather of 14 - said on Monday they forgave the suspected killer. His daughter, Tonya Godwin-Baines, had urged Stephens to surrender. "Each one of us forgives the killer, the murderer," she told Cleveland TV station WJW. "We want to wrap our arms around him." "I forgive you and love you, but most importantly, God loves you. God can heal your mind and save your soul." The victim's son, Robert Godwin Jr, said: "Steve, I forgive you... I'm not happy what you did, but I forgive you." Cleveland officials had announced a reward of up to $50,000 (£39,000) for information leading to the suspect's arrest. On Tuesday at the company's annual conference in San Jose, California, founder Mark Zuckerberg said: "Our hearts go out to the family and friends of Robert Godwin Snr. "We have a lot of work to do and we will keep doing all we can to prevent tragedies like this from happening."